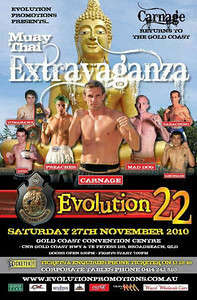 Eli Madigan Vs Harlee Avison at Evolution 22. The two middleweight Australian standout Thaiboxers face each other at the November 27th, 2010 event. I forget who requested this but thanks for waiting and being patient. ~ by fatsoking on January 1, 2011. Harlee is coming up nicely and is definitely one to watch. His father has some involvement with a gym based out of Phuket and I understand harlee has more than adequate time there to enhance his skills.